It occurred to me that I've been to an awful lot of José Andrés' restaurants: minibar many years ago, back when it was a jerry-rigged six-seat counter in the middle of Café Atlantico, not a Michelin two-star restaurant; Jaleo in D.C., é and China Poblano in Las Vegas, Bazaar here in Miami Beach. 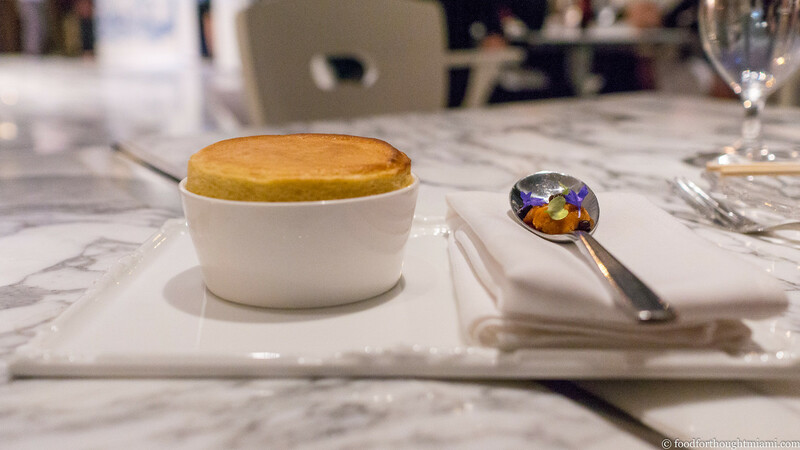 This revelation was prompted when our waiter at Bazaar Mar, his latest in the SLS Brickell hotel, asked that routine question, "Have you eaten here before?" and then followed up by asking if we've eaten at any of José's other restaurants. One of the challenges of expanding a restaurant empire – especially when you're adding another outlet in the same territory – is coming up with different concepts so you're not just cannibalizing your own business. But Andrés never seems to be lacking for ideas, with more than a dozen different restaurants under his ThinkFoodGroup umbrella. 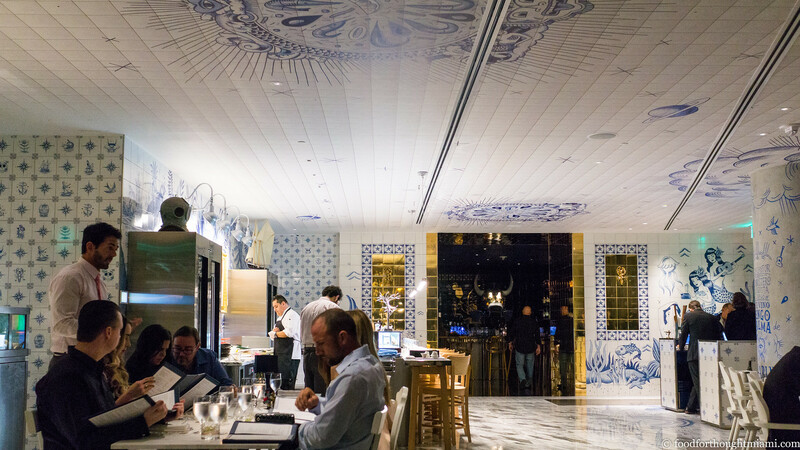 So I was somewhat surprised that when Andrés announced his second Miami restaurant, it was "Bazaar Mar," when he already has The Bazaar ten miles away in South Beach. But with my "Brickell Aversion," surely I of all people ought to recognize that Brickell and South Beach can be entirely separate worlds these days. And while there is some overlap between the two places, there's actually enough distinguishing them that you could eat at Bazaar one night and Bazaar Mar the next and have entirely different meals. (You can see all my pictures in this Bazaar Mar - Miami flickr set). As the name indicates, Bazaar Mar has a seafood focus, and if the name didn't clue you in, the decor will. 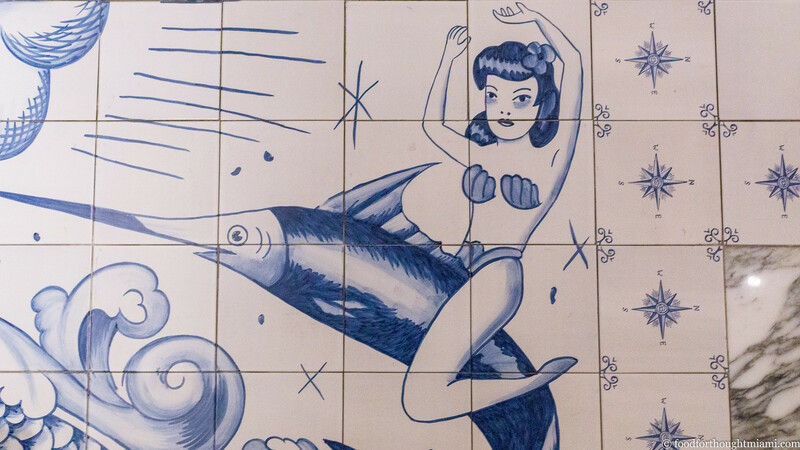 The entire space is covered in bright white tiles painted with blue nautical motifs of sailors and mermaids and sea monsters. A few gigantic horned fish heads – I'm guessing these are designed by Mikel Urmeneta, who also did the bulls' heads in Bazaar – are mounted around the dining room. The somewhat odd layout effectively has two dining rooms – one wide-open space in front, another more cloistered space in back, each of which has a raw bar counter and a view of the open kitchen at the pivot point between them. A tank loaded with live seafood runs in front of the kitchen. To the right of the entrance, a cozy bar is done up in the same nautical motifs but with a dramatic black and gold color scheme. It's a nice place to pre-game for your meal with an "Ultimate Gin and Tonic" or a liquid nitrogen frozen caipirinha slushie. 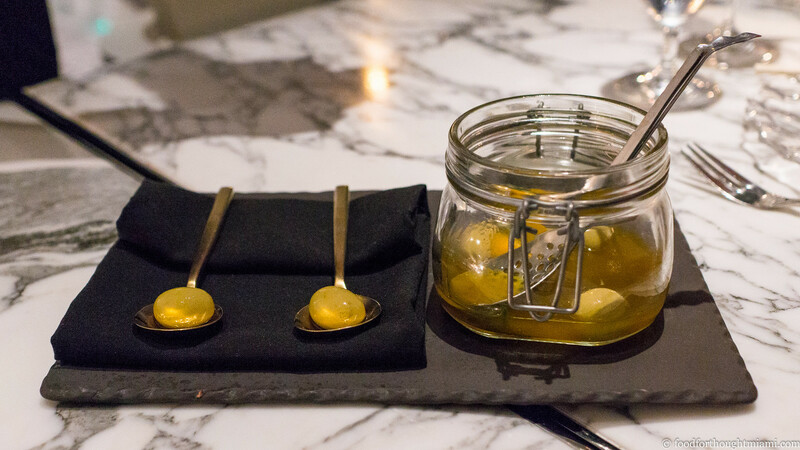 To start, a little tribute to Andrés' most influential mentor, Ferran Adrià – Adrià's signature spherified olives, the little gushers marinated in olive oil spiked with citrus zest and piparra peppers. Once, I somehow got invited to some sort of fashion event at The Bazaar on South Beach. It was not exactly a crowd that was focused on the food. So while they milled about admiring each other's clothes and sniffing the air, I perched myself next to a counter where a guy was carving slices from a leg of jamón ibérico and dolloping them with osetra caviar to make what's known as a "José Taco." I must have eaten a dozen of those things. 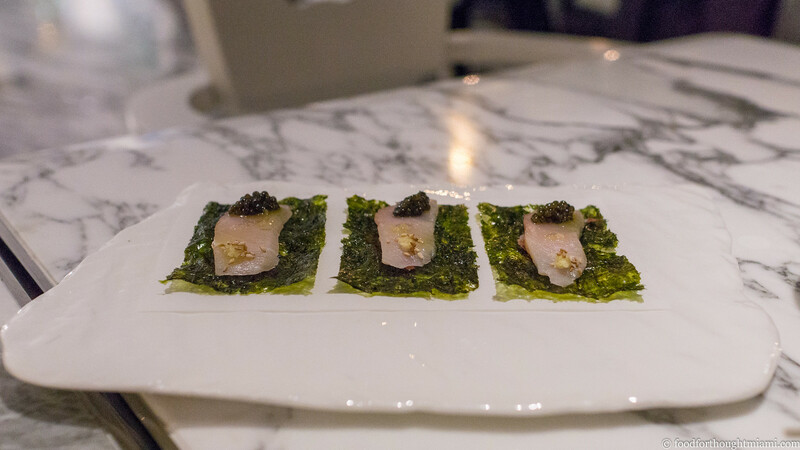 For Bazaar Mar, José has created a variation on the theme, with slices of lightly cured hamachi brushed with ibérico ham fat, topped with osetra caviar, minced ginger and sesame seeds, all cradled on a sheet of crispy seaweed. 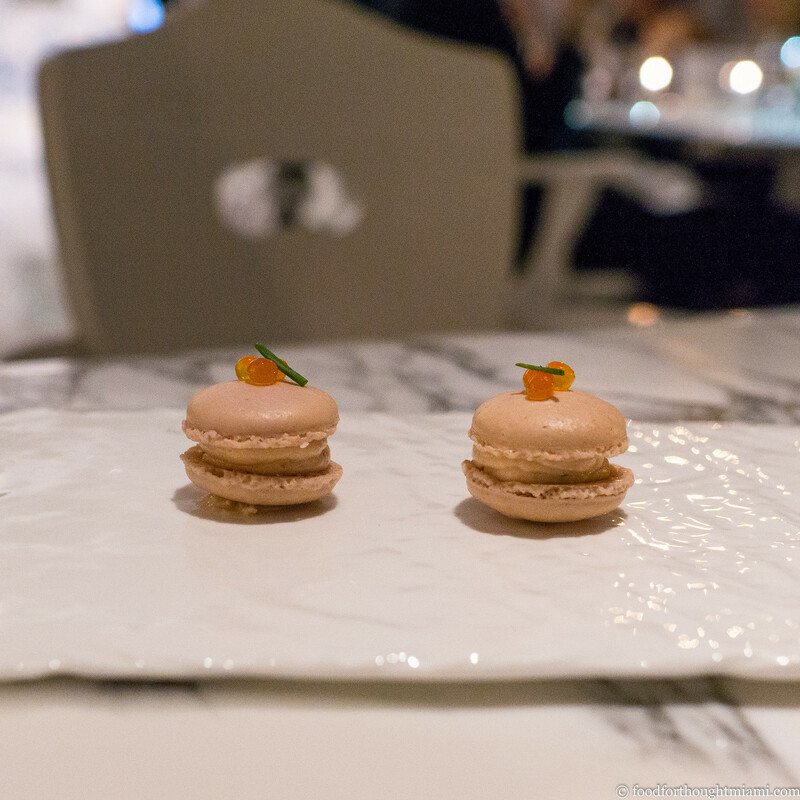 These smoked salmon macarons, with dilled cream cheese and a couple pearls of salmon roe on top, an amuse bouche from the kitchen, were perfectly executed and delicious. There were every bit as good when our server brought us a couple more toward the end of our meal. I expect they're going to find their way onto the menu and stay there. 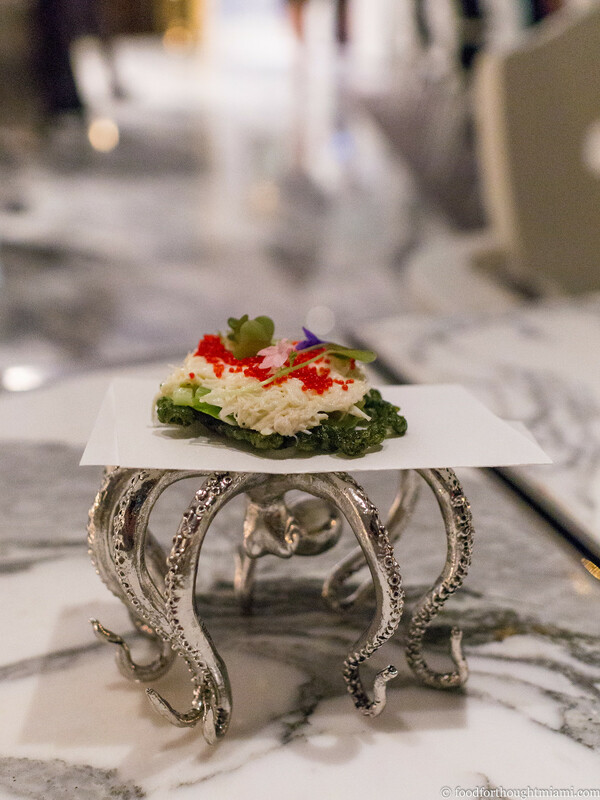 Atop that whimsical octopus pedestal pictured at the top is a "California Funnel Cake" – a little fried cake of seaweed-infused batter topped with crabmeat, avocado, cucumber and tobiko, like a reconfigured California roll. A word of caution: this is much smaller than it appears in pictures, and at $13, may seem like a lot to pay for two bites. Our server encouraged us to try the ceviche with a fresh catch of yellow jack, an upgrade over the cobia on the menu, and it was good advice. 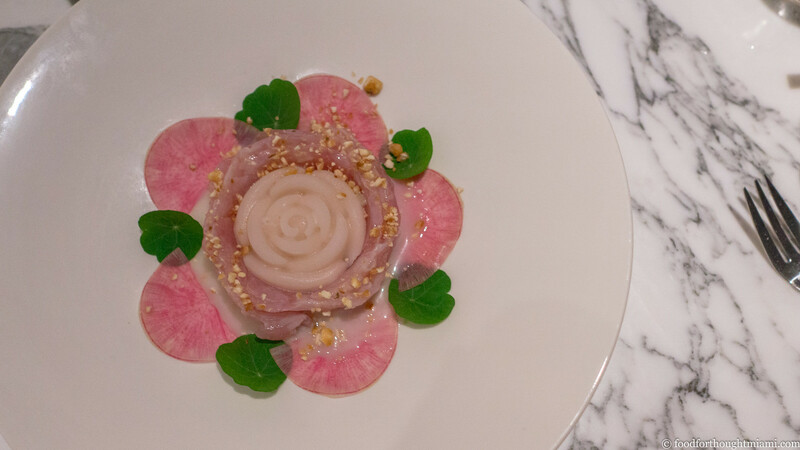 The meaty fish was arranged in ribbons around a frozen "rose" of leche de tigre, surrounded by nasturtium leaves and lightly pickled radishes, and topped with a dusting of crumbled corn nuts. The beautiful presentation was made to be destroyed: mash the frozen sauce so it can merge with the lightly marinated fish, dig around and find the sweet potato cubes underneath, and you have all the flavors of a classic ceviche back together again. 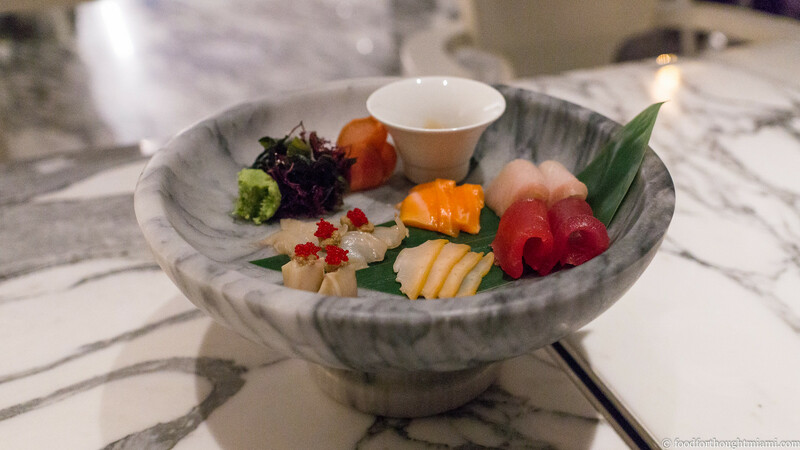 There are several raw fish and seafood items which can be ordered a la carte, but the way to go is the "sashimi selection," as long as it's going for $24. This brings you a sampling of everything: here, king salmon, fatty hamachi, ruby-hued tuna, snappy sliced abalone, and two different cuts of geoduck, topped with a sauce of its liver and red tobiko. Andrés says he's selling this at a loss, and it's maybe one of the best values on the menu. One of our favorite dishes of the evening was this uni soufflé, its flavor deepened with a soy caramel and brightened with sansho pepper. Our waiter said they'd received mixed feedback on the dish and it seems to bounce on and off the online menu that's posted on the website. I'd say it's a keeper. At Bazaar on South Beach, they serve a miniature Cuban sandwich in honor of Café Versailles. Bazaar Mar has a few mini sandwiches too, including this "Po Boy José!" 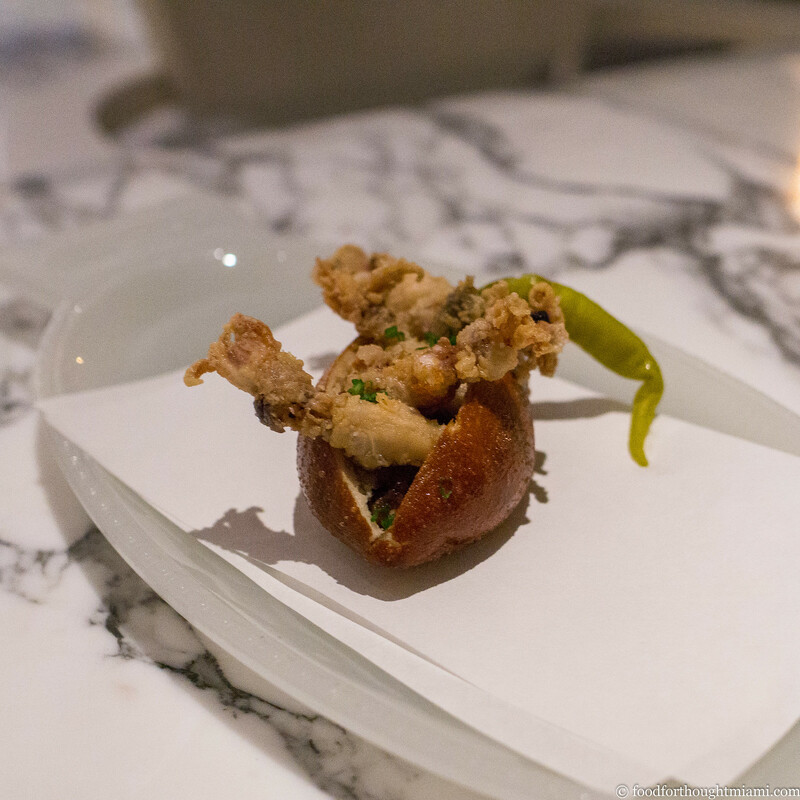 with crisp fried baby squid, a piparra pepper and aioli mounted in a puffy, soft steamed brioche bun. It brought back flashbacks of the outstanding bocadillo de calamares we had at El Brillante in Madrid. 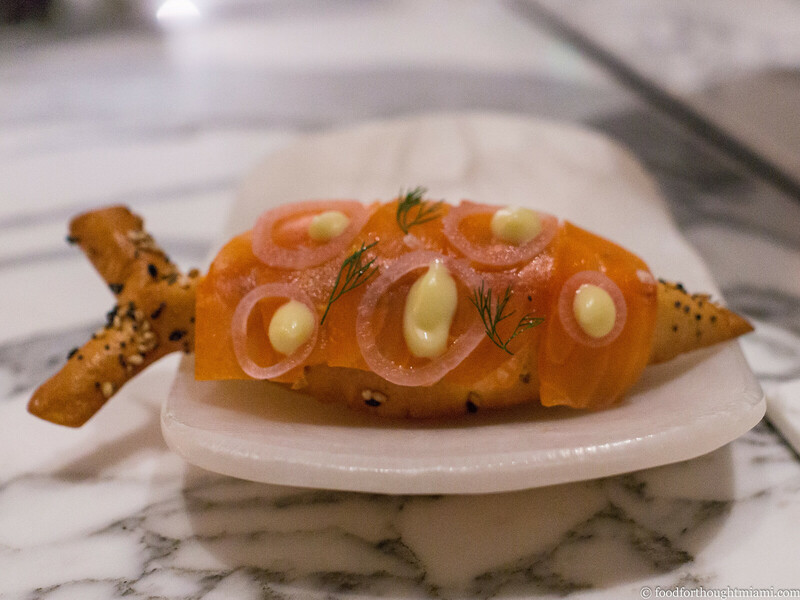 José's "Bagel and Lox" sandwich was equally delicious and equally evocative, layering thin slices of Russ & Daughters smoked salmon over a crusty, fish-shaped, everything-spiced air bread filled with cream cheese. Little rounds of pink pickled onions dotted with aioli completed the decoration. It genuinely tasted like all the best parts of a bagel with lox and cream cheese. The larger dishes on the menu tend to skew a bit more traditional, but that doesn't necessarily mean boring. 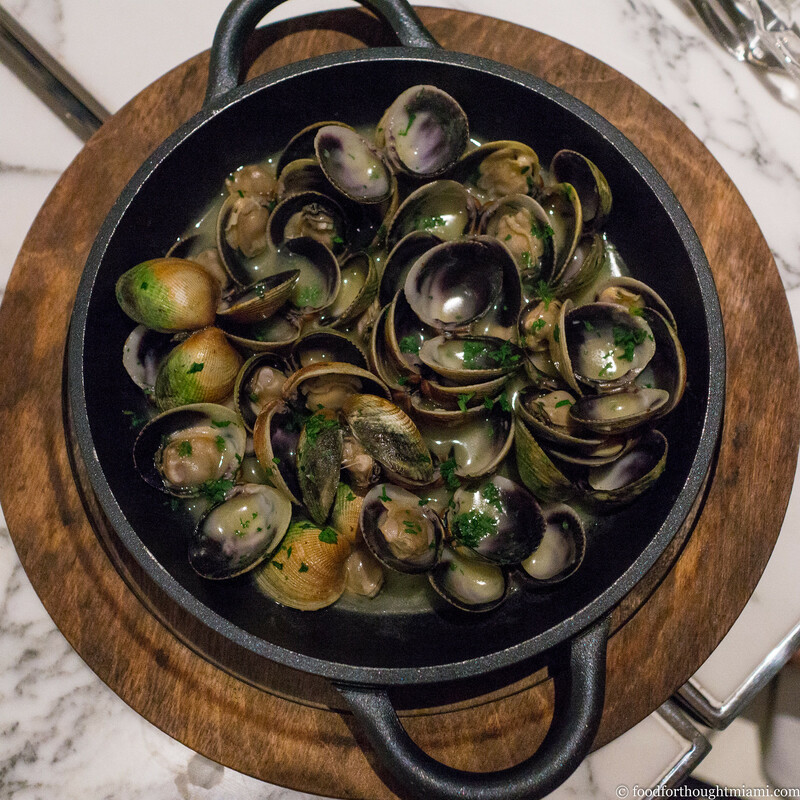 I loved these little cockles, fresh from the tank, in a Basque-style pil pil sauce, an emulsion of garlic, parsley olive oil and fish juices. 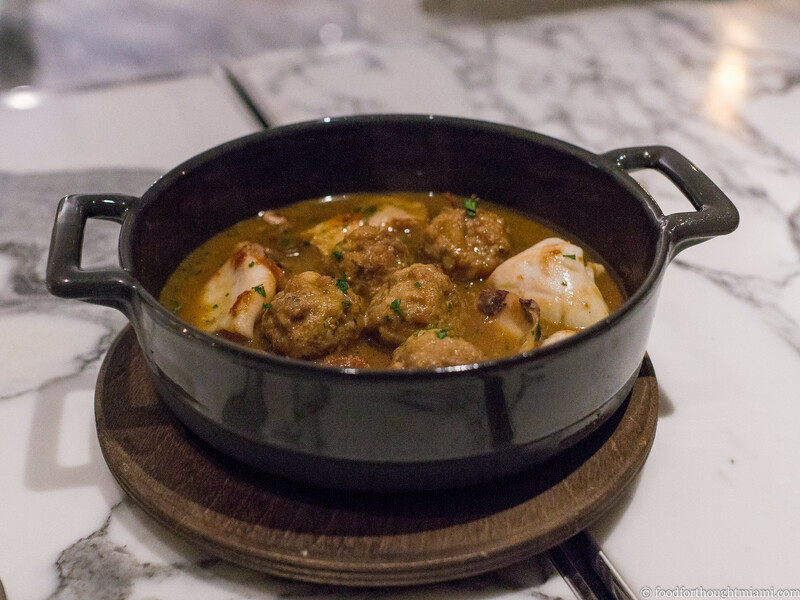 And this stew of Ibérico pork meatballs with baby squid could have been straight from Catalonia, where they have much broader ideas on the subject of surf 'n' turf ("mar y montaña") than just steak and lobster. I wasn't sure if I saw the need for a Bazaar Mar when we already have Bazaar South Beach, but I'm sure glad it's here. 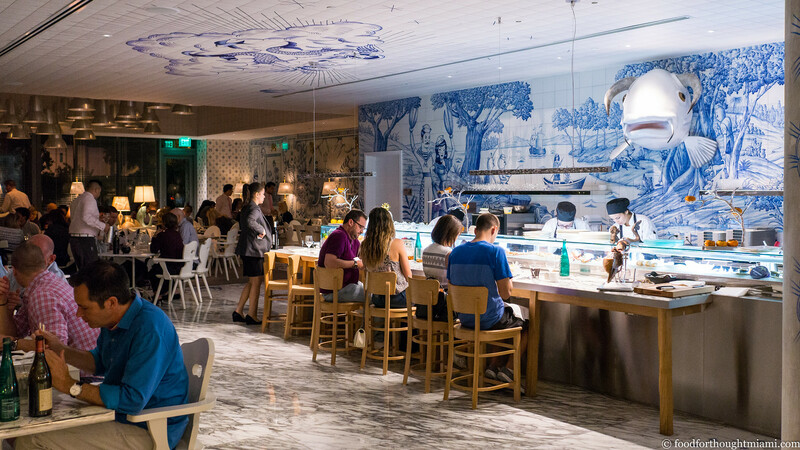 The style of the places is very similar – Andrés may be as good as anyone at serving elevated, serious food while keeping the vibe fun and unfussy – but Bazaar Mar really does stay faithful to theme. Other than a half-dozen vegetables dishes and a few items "For the Meat Eater," pretty much everything comes from the ocean, and a meal here feels indulgent without necessarily feeling heavy. I may have to get over my Brickell Aversion. It also occurred to me, between the extra amuse bouches and the slew of restaurant staff who visited our table, that I'd now been outed. Either someone checked our OpenTable notes, or that's some really attentive service. Not that any other tables seemed like they were being neglected; even with a full house on a Saturday night, there was what seemed like a small army working the floor and keeping everyone happy. When they brought it to the table, I felt like Derek Zoolander when he saw the Center for Kids Who Can't Read Good. With lots of little plates and big prices, the cost of a meal can quickly add up. But with such an expansive menu, you can probably plot a meal that won't break the bank if you're strategic about it. This was tasty but too salty for me, one of the only misfires of the evening. The SLS's location on the south end of Brickell, so you can get to it without slogging across Brickell Avenue or SW 8th Street, helps. So does $10 valet parking, which is more reasonable than just about any of the South Beach hotels.